They are a people rooted in design. From early frescoes of Padua to pointed Prada wingtips, Italians are born into fluency with line, shape and color. Unafraid to exploit pigments from the earth. And dream them into patterns. To adorn the world. To tell stories through pictures. To refine the art of dining. So what might be a color so exotic, so profane that would halt the Sicilian stylist? Or the Sienna Chef? Actually the jury is still out. But the question still gives us pause. Because there are unwritten rules to color. Despite rainbows nightmares invented by process food companies, we know that Cherry is not blue. Ever. And blueberry gleams only blue under the bright sun. Under the weight of a pestle, they cry purple. Try it for yourself. Add blue dye to your favorite chardonnay and watch the guests reach for the doorknob. So why is it that a color as common as green can inspire a second look? Not the vapid shade of Iceberg. Or the iron rich spinach. Or the cheery green of grannysmith. But that creamy green. Illustration #1. The fava bean puree crostini from Cru (pictured above). Mashed potato silkiness. A green goddess hummus. Floating on top of toasted bread that bears muscle chew of authentic ciabatta. The dish is finished with balsamic syrup, Parmesan shreds and chives. Illustration #2. Pickled ginger mayo with cilantro. The sweet heat with Monet glasses. Illustration #3. 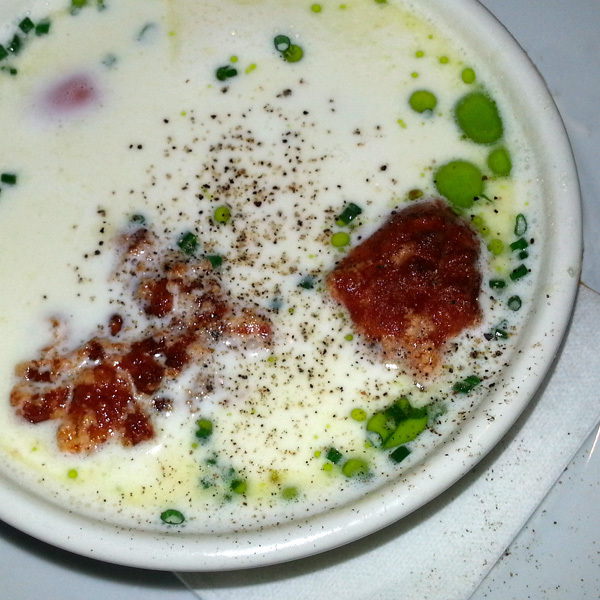 Corn chowder with small pools of peppery olive oil. Illustration #4.Crunchy oysters standing puddles of pesto cream. Illustration #5. 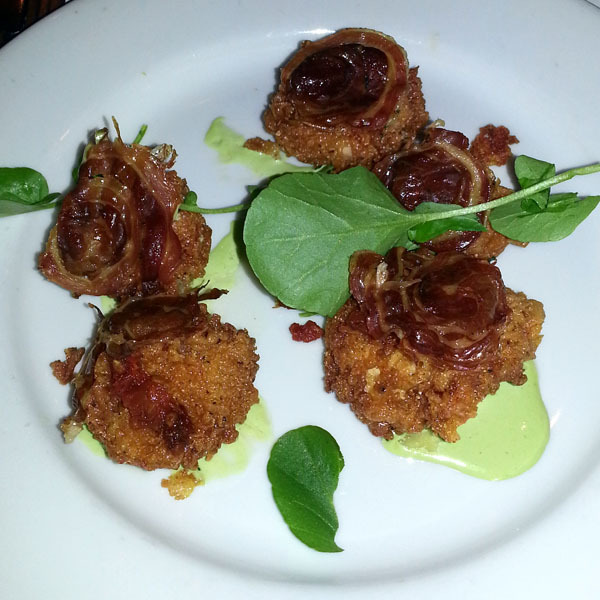 Special appetizer from RDG. Meaty brisket from the moist end, pan-kissed and glistening. Seared sea scallop for the middle teir and sauteed chanterelles on the roof. All of which glides on a poblano cream. Illustration #6. Salmon sashimi dressed in an Italian suit. Drissled with basil oil, striped by balsamic and hatted by parmesean. The light refracting from the white dish through the oil glows green like velvet drapes in a Van Eyck oil painting. Illustration #7. 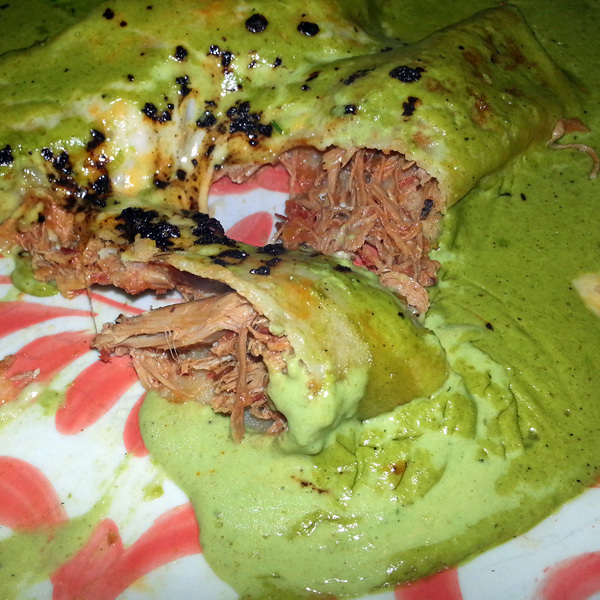 The duck enchiladas from Fonda de San Migel. Plated on a charger-sized dish painted with coral swirls on a white field. 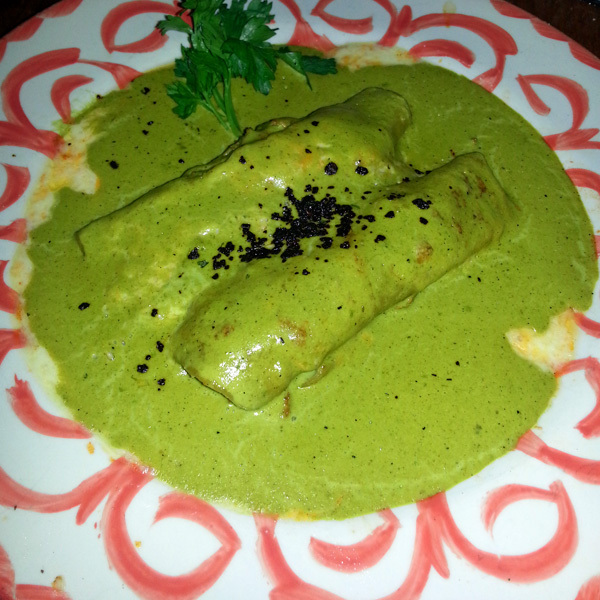 These two enchiladas, packed with shredded duck breast, swim in a pond of pea-green sauce. A sauce built on the austerity of poblano, spinach and cream. Bespeckled with black truffle. All cases exhibit the deft mind of chef. It’s a plot twist. Sudden turbulence on the ascent. A visual static electric charge. The fun of jay-walking downtown. Our back minds work to resolve the conflict. It’s a color found in nature, yet not at dinner time. And it’s a tool in your communication kit. A chance to lead your diners on a journey. Win their intellect by teasing their retina. Declare your heritage one color at a time. Feeling Dutch? Orange it. Thai? Purple it. Hungarian? Crimson that dish. Indian? Paint it turmeric yellow. Whatever it is, do it with intent and intensity. Have cream green pulsing through your culinary vocabulary? Share it.